Simple Seafood salad is something that I love. It’s one of my favorite things to buy at the store, but I don’t do it often because it’s what I consider a luxury item. 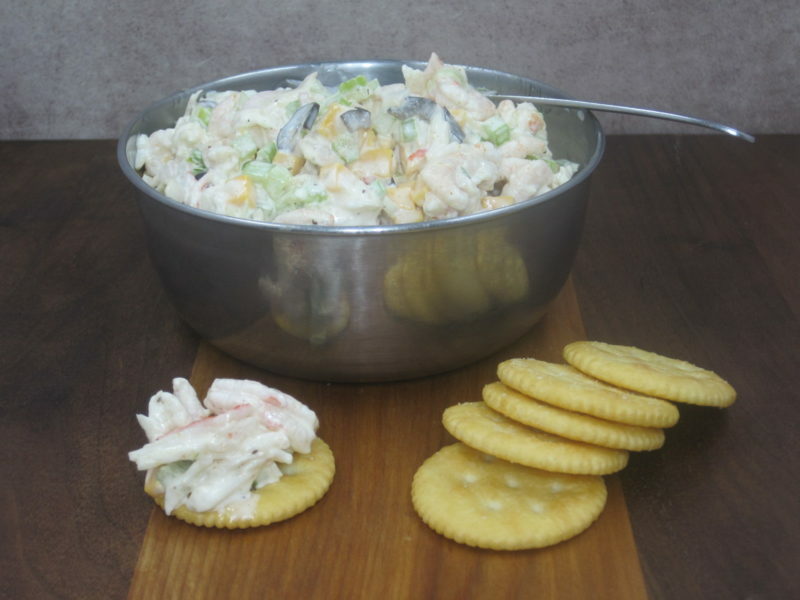 I have been making crab salad at home for years, so I decided to try my hand at making a copycat of the seafood salad that’s available in the deli at my local grocer. Making simple seafood salad is, as the name implies, very simple, and I get much more for less money by making it myself. This Simple Seafood Salad will also make appearances on our table during the holidays when I like to serve an appetizer spread. This recipe makes about 4 1/2 cups of seafood salad. My cost was a little higher than usual because I didn’t have any shrimp in the house and ran to the closest store to buy some. The cost below indicates this. Usually, I stock up when shrimp is on sale and load it into my freezer. 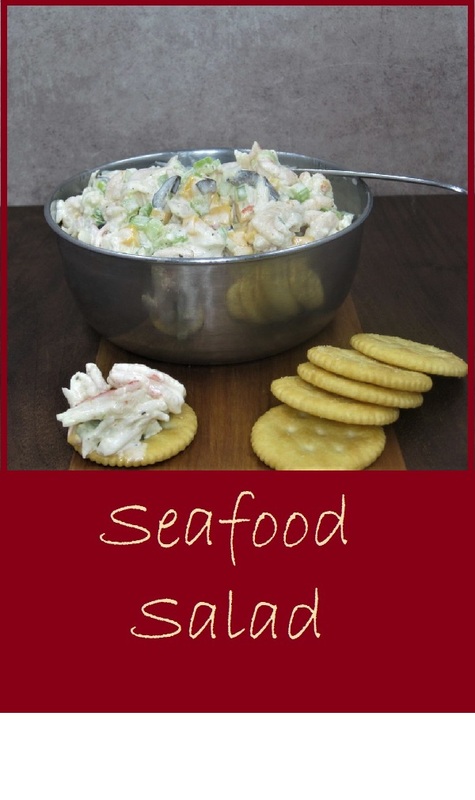 In addition to being easy to prepare, this seafood salad is incredibly versatile. It can be served in a variety of different ways. Place a serving of this simple seafood salad on top of your favorite green salad along with some hard boiled eggs for a hearty lunch or dinner. Use it as a filling in a sandwich–we like it on potato rolls topped with lettuce and tomato slices. This makes a great summer supper when served with some fresh fruit on the side. Serve the salad on a tray, surrounded with buttery crackers. This can be a light lunch, a snack, or an appetizer. All of these possibilities mean that I could make simple seafood salad every week and serve it in a different way. However you choose to serve this salad, it’s soon to become a family favorite (unless, of course, you don’t like, or eat, shrimp or crab). 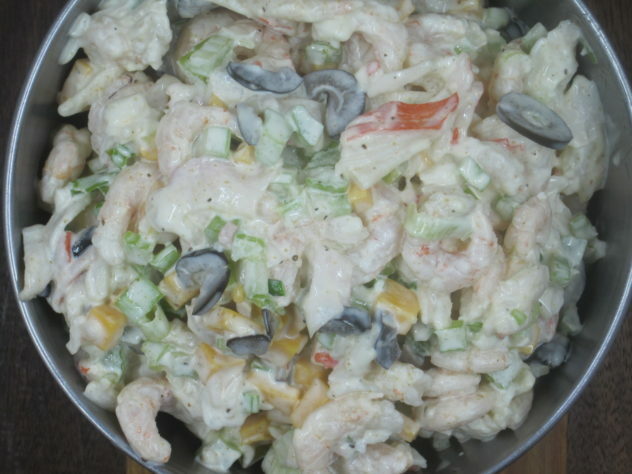 Give our recipe for Simple Seafood Salad a try and let us know what you think by leaving a comment below. This recipe is easy to prepare, and tastes just like the expensive seafood salad that 's sold in the deli section of your local grocery store. The total cost of the recipe is $6.92 or about $1.16 for a ¾ cup serving. Separate chunks of surimi into small bite sized pieces. I do this with well washed hands. Place prepared surimi into a medium sized bowl. Add shrimp to bowl. If you are using frozen shrimp, place them in a plastic bag and allow them to thaw by immersing the bag in cold water while you prepare the rest of the ingredients. Finely dice the celery, green onion, and the cheese. Add celery, green onions, and cheese to bowl with surimi. Thinly slice the olives and add to the bowl with the rest of the ingredients. Sprinkle the top with Old Bay seasoning. Add thawed shrimp to the bowl if you didn't already. Serve atop a bed of greens for a salad; use as a filling for sandwiches, or with buttery flavored crackers. Nutrition information is for 1/6th of the recipe prepared according to the recipe above or about 3/4 cup of simple seafood salad. It’s been years since I’ve heard the brand name Old Bay. Have any idea what’s in it? Where can you buy it? Hey, I’m coining a phrase. When it gets so hot that you don’t wanna cook, then it ” a hunnerd ‘n’ hot.” It doesn’t matter what the actual temperature is. Hunnerd ‘n’ hot–I like it. As for Old Bay, it’s available in the spice aisle of most grocery stores. (Sometimes, it’s by the seafood counter.) Ask someone in the store to help you find it. The label says it contains “CELERY SALT (SALT, CELERY SEED), SPICES (INCLUDING RED PEPPER AND BLACK PEPPER) AND PAPRIKA.” Who knows what the other “SPICES” are? There are several recipes on-line, but I haven’t tried any of them, so I can’t recommend which one is the best. Old Bay is also a required ingredient in my shrimp boil foil packet which is another good hot weather recipe that you should definitely try. It’s one of Baker’s Man’s favorites.